Looks great! You need to post the recipe now! Outstanding!! 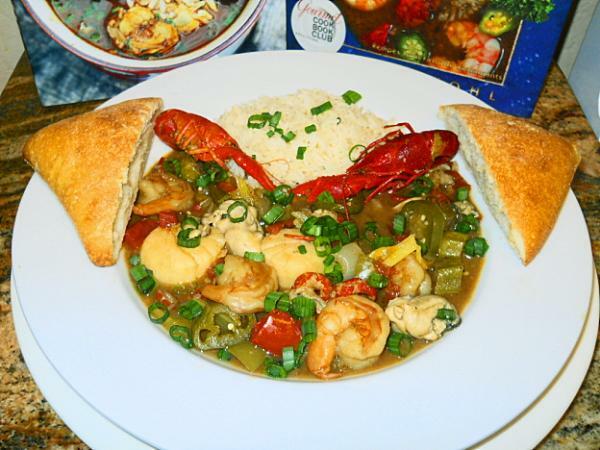 Gumbo never looks visually appealing to me but that is a work of art! I too would love to have the recipe. *drooling* I need an extra large spoon and bib! Didn't happen without the recipe! Looks good! Sorry to say, I don't have the recipe because I just cooked it off the top of my head! Basically I started out with the roux (dark) added the trinity and fish & veg stock , a touch of fish sauce. Added cajun seasoning and hot sauce to taste. Added: garlic , shrimp , oysters , crawfish tail meat , whole crawfish , scallops , orka , gumbo file and a can of roasted tomato's. Garnished with green onions and cooked rice. I use Zatarain's rice , it has more flavor then plain white rice. Thanks for this S&P........so often Gumbo not only looks, but tastes like a muddy mess. Good job. Do I understand that you used Asian fish sauce? Brilliant!